Noel Keywood auditions this superb pair of ribbon/moving coil hybrids. This excellent mid-price floorstander is reviewed by Noel Keywood. 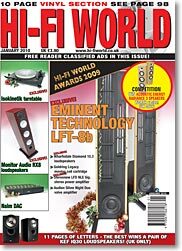 Just �300 buys you these finely finessed floorstanders, finds Noel Keywood. unusual Single Ended tube amplifier gets a warm up from Noel Keywood. David Price finds much to like in this quirky solid-state power amplifier. David Price is impressed by a new digital to audio converter from Salisbury. David Price details the best products we've reviewed over the past year. 72 Robert Kelly is your host at the annual Rocky Mountain Audio Fest. Tim Jarman remembers the inspiration for Sony's Walkman Professional. Neville Roberts tries out an interesting new turntable. Noel Keywood samples a new mid-price moving coil. Tony Bolton auditions this new budget phono stage. David Price reads Tim & Nick Jarman's 'Bang & Olufsen' book. A chance to win Acoustic Energy's Radiance 3 loudspeakers worth �1,500! Paul Rigby goes west with the Sons of the Pioneers' 'Way Out There'.